An Atlanta visitor might easily miss Emory University’s Michael C. Carlos Museum, but as a frequent traveler there I’ve learned to stop by. Temporary shows are interesting and the permanent collection itself is fine. The building, designed by the late Michael Graves relatively early in his career, gives thoughtful attention to what it houses and is a good setting for what goes on there. 7 1/10 x 5 15/16 x 3 9/16 in. The focus of the Carlos collection is ancient civilizations – think Egypt, Greece, Rome, also the Americas along with Asia, Africa, and the Near East. It is this aspect that most interests me, but the Museum also has an extensive collection of works on paper from the Renaissance to the present day. Right now and through January 3rd, the special exhibition is “Indigenous Beauty: Masterworks of American Indian Art from the Diker Collection.” This extraordinary collection ranges from works made before native North Americans were in contact with Europeans to late 20th, early 21st century objects and from across the great spread of what became the United States. The broad boundaries of time and place serve to emphasize both similarities and disparities. Several immediate impressions make themselves felt on visiting this exhibition. One is the vital nature of women’s contribution to the society. The making of these objects was not exclusively left to them, but much of it was and their creativity and skills are clear to see. Another is that babies and children in general were deeply cherished. The workmanship that went into elaborate baby carriers, which could be strapped to the mother’s back, and into clothing for older children is too carefully executed to suggest any other interpretation. Some of the material is very ancient, from the 2nd to 5th centuries A.D., found preserved in ice in the remote Bering Strait area where Alaska and Russia now are near neighbors. One of these pieces is a small female figure, stripped to the most telling lines of its form like a modernist sculpture, carved from walrus ivory. Despite its great age, the figure strikes an instant response from today’s viewer. 7 1/8 × 8 1/4 in. Carving skills continued down the ages, as can be seen in a group of wooden bowls from the 18th and 19th centuries. The showiest of them is identified as a Belt Cup; its elaborately carved surface includes a small, flat-tailed animal, surely a beaver. Apparently a Belt Cup could be attached to one’s waist, at the ready when needed. It’s interesting to see what came before the Europeans’ introduction of glass beads. Patterns were already established, quill embroidery was an element, quietly handsome designs fully in place. But glass beads! The shimmer and the show! Made in Venice and in Belgium, the small, vari-colored balls must have seemed sensational to makers and wearers of these garments – who surely had little idea of Venice or of Belgium. Interest in glass persists. Preston Singletary, born 1961, widely recognized for his glass works, is represented here by a 2011 glass sculpture based on shaman rattles. His work incorporates traditional themes from his tribe, the Alaska-based Tlingit people. 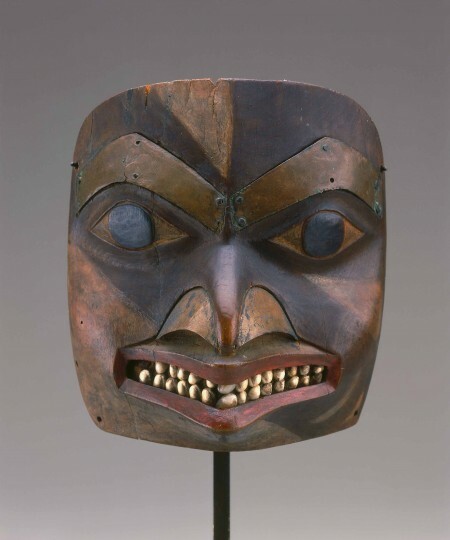 The Tlingit are a visually acute society. Another piece from them, this one anonymous and from the late 19th century, consists of a tunic and leggings made from cedar bark, wool and metal cones, the decorations organized in formal, thoughtful juxtaposition. A little group of beaded moccasins ca. late 19th century are surprisingly small in size – are they for women or for children? 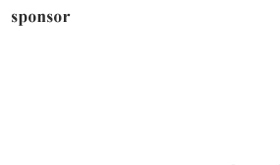 Surely not for men, and I wonder about adult women, in a culture in which walking is a huge element in getting around. So – if indeed they are for children – they’re another example of the pride and care that went into raising offspring. This was, it seems, a dressy culture. A decorative comb, to be worn as ornament, dates from ca. 1680 and is made from a moose antler. Its design features two European figures. Storage bags, meant to carry food or other supplies, are made in matching pairs, perhaps to be slung over a horse’s back? They are good to look at as well as eminently practical. 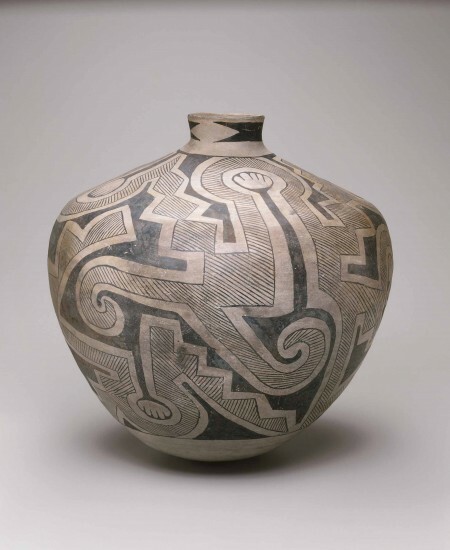 Potters of the Southwest were perhaps the first artists of the region to attract wide-spread attention. Some even became moderately famous, among them Maria Martinez and her husband, Julian, of San Ildefonso. She is far better known than he, partly because of his early death in 1943 while she lived to 1980, but the skill and creativity of each accounted for their experimentation and revival of ancient techniques. 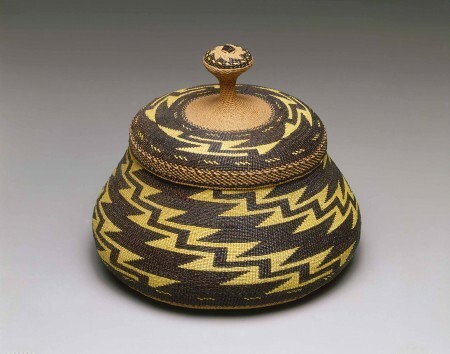 The spirit that illuminated the Martinez work is handsomely carried on in two fine late 20th century pottery bowls by Nancy Youngblood, which are shown with the Martinez pieces. Youngblood is a widely recognized and formally trained artist whose Indian heritage is an indispensable element in her work. The Charles and Valerie Diker Collection remains active and continues to expand; the exhibition includes recent acquisitions not previously shown. The collectors seem drawn to works that reflect strong aesthetic sensibility and are in no way limited by period or place other than North America. 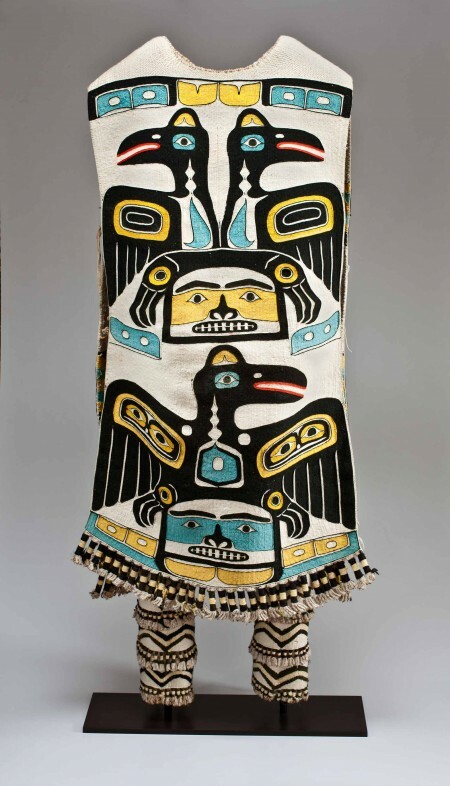 “Indigenous Beauty” is the first traveling exhibition curated from this exceptional collection, although selections have been presented previously at the Metropolitan Museum of Art (1998–2000) and the Smithsonian’s National Museum of the American Indian (2003–6). The exhibition goes from the Carlos Museum to its final showing, at the Toledo Museum of Art, February 14 – May 11, 2016. Its accompanying, fully illustrated catalog provides a range of commentary on objects in the exhibition by experts in the field, including new research on many specific items. The long resonance of the culture’s instinctive aesthetic ideas is perhaps the chief thought one takes from Indigenous Beauty, but enjoyment of the results will also remain pleasurably in mind.